We’d love your help. Let us know what’s wrong with this preview of The Little Lame Prince by Dinah Maria Mulock Craik. This is a pre-1923 historical reproduction that was curated for quality. Quality assurance was conducted on each of these books in an attempt to remove books with imperfections introduced by the digitization process. Though we have made best efforts - the books may have occasional errors that do not impede the reading experience. We believe this work is culturally importan This is a pre-1923 historical reproduction that was curated for quality. Quality assurance was conducted on each of these books in an attempt to remove books with imperfections introduced by the digitization process. Though we have made best efforts - the books may have occasional errors that do not impede the reading experience. We believe this work is culturally important and have elected to bring the book back into print as part of our continuing commitment to the preservation of printed works worldwide. Yes, he was the most beautiful Prince that ever was born. Of course, being a prince, people said that; but it was true besides. The Prince's christening was to be a grand affair. By six in the morning all the royal household had dressed itself in its very best; and then the little Prince was dressed in his best - his magnificent christening-robe; which proceeding his Royal Highness did not like at all, but kicked and screamed like any common baby. To ask other readers questions about The Little Lame Prince, please sign up. Emily yes. Orphan Prince is trapped in a tower by an evil uncle. Magical Godmother gives him a traveling cloak. I loved this book! Once when I was about 8 years old, I got sick while on vacation in California. Unfortunately, it was the day we were all scheduled to go to the beach. I was crying as I watched them leave down the driveway of my granma's house. My grandma, in an attempt to make me feel better, started to read to me from this book. I kept begging for her to continue, and so she read to me most of the day until it was finished. The memory is so precious to me, I wouldn't give it up for a thousan I loved this book! Once when I was about 8 years old, I got sick while on vacation in California. Unfortunately, it was the day we were all scheduled to go to the beach. I was crying as I watched them leave down the driveway of my granma's house. My grandma, in an attempt to make me feel better, started to read to me from this book. I kept begging for her to continue, and so she read to me most of the day until it was finished. The memory is so precious to me, I wouldn't give it up for a thousand days at the beach. I would've liked this better if the narrative voice was a little less intrusive. The narrator/author tells us that this originated as an oral bedtime story for her daughter, and the style very much reflects that. It actually reminded me quite a lot of the episodic tales that my mother told me as a very small child. That made be feel warmly toward the story in general, but as an adult, I still found it a bit... hmm, not quite condescending, but perhaps a bit too... instructive? The prince of the s I would've liked this better if the narrative voice was a little less intrusive. The narrator/author tells us that this originated as an oral bedtime story for her daughter, and the style very much reflects that. It actually reminded me quite a lot of the episodic tales that my mother told me as a very small child. That made be feel warmly toward the story in general, but as an adult, I still found it a bit... hmm, not quite condescending, but perhaps a bit too... instructive? The prince of the story is orphaned in infancy, and worse, partially paralyzed due to an accident. His uncle seizes his rightful throne, and has the boy imprisoned in a remote tower, with only a criminal nursemaid for company. But what no one knows about is the boy's (fairy?) godmother, who gifts him with a magic traveling cloak and some words of wisdom. This is a very old book that my mom loved growing up. She found it at an antique store and then made me read it, because it was such a favorite of hers growing up. And I think it's one of those books that you have to grow up loving. It was very sweet- almost TOO sweet, really. The writer addresses the readers directly (a la Jane Eyre) at several points to ask you how you might have felt if such-and-such had happened to you. The poor little lame prince is locked away in a tower until his godmot This is a very old book that my mom loved growing up. She found it at an antique store and then made me read it, because it was such a favorite of hers growing up. And I think it's one of those books that you have to grow up loving. It was very sweet- almost TOO sweet, really. The writer addresses the readers directly (a la Jane Eyre) at several points to ask you how you might have felt if such-and-such had happened to you. The poor little lame prince is locked away in a tower until his godmother comes and gives him a magic cloak that can float him through the window to see the world below. He's thrilled to death by everything, since it's all new to him. It has a nice, predictable ending. But it's very old fashioned. I don't think my kids would listen to it now very easily. There's no mystery, suspense or humor that appeals to our modern sensibilities. I mostly liked it because I could just see my mom as a little girl reading it, loving the gentle little prince and wishing the best for him. This was one of my favorite books as a child. I owned it, and have probably read it at least 50 times. It was pure escapism for me. All I wanted to do was to get on a magic cloak, and fly away from my life. My 8 year old granddaughter Allison was in the midst of doing a school project, and asked me what had been my favorite book was when I was an eight year old myself. I immediately thought of this book, and re-read it for the up-teenth time. It was very nostalgic. It's been many years since I read this charming, but bittersweet story. Goodreads doesn't actually show the edition of the book I own, which was handed down to me from my Grandfather, who received it as a gift from his aunt in 1925 for his 5th birthday. I went to Art Park back in the 80s, an outdoor theater-on-the-grass, to see a musical of The Little Prince. I was like, “Wait a minute, this isn’t the story! What’s with all the planets?” Silly me. It was an adaptation of the Little Prince called The Little Prince and the Aviator, and not what I was thinking at all. 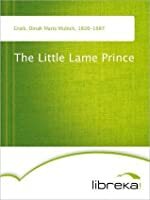 The book I loved was The Little Lame Prince by Miss Mulock (Dinah Maria Mulock Craik). My copy is by M. A. Donohue & Co. and has no copyright date. I'm guessing circa 1914 based I went to Art Park back in the 80s, an outdoor theater-on-the-grass, to see a musical of The Little Prince. I was like, “Wait a minute, this isn’t the story! What’s with all the planets?” Silly me. It was an adaptation of the Little Prince called The Little Prince and the Aviator, and not what I was thinking at all. 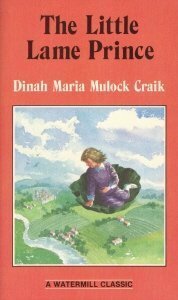 The book I loved was The Little Lame Prince by Miss Mulock (Dinah Maria Mulock Craik). My copy is by M. A. Donohue & Co. and has no copyright date. I'm guessing circa 1914 based on the dates of the publishers other books listed in the ad at the back of my book (at 40¢ each). I had no idea when I read it that it was originally published in 1875. A bumbling nurse drops the baby prince on his christening day and cripples him. His fairy godmother sees it happen. The Queen dies, then the King dies, and his Uncle locks him in the tower where he stays for 15 years. A depressing story, now that I think of it, until his godmother brings him a magic cloak. With it he is able to travel all over the world. As he grows he is told that he is the true King. When the wicked Uncle dies the people find out that the Prince is not dead as they had been told and becomes the King. Anyway, typical Victorian gloom and doom writing. I did love the idea of a magic traveling cloak, but I think what I got out of it was the handicap child’s ability to overcome adversity, although most likely not the intention of the author. This was the first read alone chapter book I read as a child that had tragedy and death so it had quite the impact on me. This book examines the prejudices of many societies, and resilience of children with handicaps. I first read this one summer as a child, then again as a teen, and this is the third time. This book deserves to be considered a children's classic. I'm not really sure what to say about this book... I had never heard of this author before Mo's review, and reading it as an adult was quite pleasant but nothing extraordinary. Maybe if I'd grown up with these stories, I may have appreciated them more? I listened to the Librivox recording, but didn't like the narrator's style: she read too fast and included too many silly "squeaky" voices. In ten gentle chapters with simple sketches we meet another charming child--this one lame but royal, and an orphan. (Somewhat reminiscent of Old Testament Jonathan's crippled son.) A healthy baby prince is dropped by a careless nurse enroute to his christening; when both his parents die, he is at the mercy of his ambitious uncle/regent who has him secreted away to a lonely tower on a barren plain. (Reminds me of the Chinese folk tale: The Emperor and the Kite). With only VICTORIAN FLYING CLOAK! With only a female convict as a nanny, the little lame prince grows to boyhood in utter loneliness, until his fairy godmother gives him a magic cloak which he uses to travel on the sly. Not to escape, but to see more of the world, and the kingdom which should be his. But would the people accept a crippled monarch, even if he could escape and denounce his uncle? The cloak has an even greater significance for him, since it provides him with love (reminding him that ONE person cares for him) and hope. Is being a king someday what he really wants for personal happiness? An ingenuous tale which will soften the hearts of modern readers--but probably bore kids of the 21st cnetury, alas. Several Years ago, I picked up an 1893 edition of this little book in a little Antique store in Connecticut. It has an inscription on one of the first pages: "Merry Christmas to Maggie, from Nellie. Dec. 25th 1897. What a cool thing. I got it out and read it again the other day, but got to the end and remembered that it was missing about the last three pages. I found the whole story on Wikisource, and copied it to put in the book. Very Cool. It's a wonderful little story about a little prince w Several Years ago, I picked up an 1893 edition of this little book in a little Antique store in Connecticut. It has an inscription on one of the first pages: "Merry Christmas to Maggie, from Nellie. Dec. 25th 1897. What a cool thing. I got it out and read it again the other day, but got to the end and remembered that it was missing about the last three pages. I found the whole story on Wikisource, and copied it to put in the book. Very Cool. It's a wonderful little story about a little prince who was accidently dropped on his head on his Christening Day, and was paralyzed from the waist down. But of course back then, they didn't know what any of this was. He just grew up, and could never walk. The story has wonderful messages for Children and grown ups.... about forgiveness (especially for things that happened in childhood), rising above disabilities, making the most of a bad situation, and not letting any of it keep you from finding a way to reach out for your dreams. What a wonderful find this story was. I imagine it would make a lovely bedtime read-aloud for a child, as it would provide opportunity for conversation on accepting hardship, how one might react when things happen out of our control, and the importance of forgiveness and humility. Very rare to find in a (well-written) children's book. [This rating and review applies to the ten chapters of "The Little Lame Prince" rather than the five short stories I was surprised to find at the end, and didn't en What a wonderful find this story was. I imagine it would make a lovely bedtime read-aloud for a child, as it would provide opportunity for conversation on accepting hardship, how one might react when things happen out of our control, and the importance of forgiveness and humility. Very rare to find in a (well-written) children's book. This is an example of a book you read as a child that stays with you forever. I don't even remember how old I was when I read it, but recall clearly the flights of fancy my mind took as a result. I was young enough to be able to dream about being locked in a tower by an evil uncle and flying to freedom. I remember becoming so caught up in the story that I read it on a folded blanket on the floor that I could pretend was my own traveling cloak. I am delighted that it is still in print! The little lame prince when I start to read it in the beginning I felt boring but when I read it more I understand each part and what they said about the prince . This book was amazing and I like it a lot because I learned how to deal with ather people and alao it learned us to be nice with people and don't make them imbaresing so I suggest everyone to read this amazing book because it's really interesting . The stories are a bit involved for small children. However, the stories are nice moral based fairy tales. This Kindle version holds six stories. Loved this book at a child! Several scenes from it made indelible pictures in my mind I have to this day. One of my favorite books when I was a kid. Read it again as an adult and still enjoyed it. This is a GREAT book. I remember it still and I read it as a 9 year old maybe? I think it's partly the Little Prince's isolation and loneliness. My childhood was turbulent...mom married three times (the name I wrote was a reminder of one of those husbands). I was often left alone to amuse myself, as was Prince Dolor. His goodness in the face of his afflictions inspired me. He was not bitter about the fact he couldn't use his little legs...he just accepted that and moved on. His isolation was eased by his fairy godmother who gave him the gift of magic flight and travel. Was that another element I loved? Living on the top of that hill in MO, with only my grandmother for company, did I wish for a magic cloak like his to escape my hilltop like he escaped his tower? His goodness, even to those who imprisoned him and cut him off from life, was inspiring. With a little sister, did I try to emulate his loving acceptance? The story is treacly and sweet...the asides to the gentle reader were didact, speaking of the lessons we should be learning. The book came with a sentimental recommendation from a dear friend. I was reading an old, well-read copy with delightful illustrations. Despite all these positives, I loathed the story. I rea The book came with a sentimental recommendation from a dear friend. I was reading an old, well-read copy with delightful illustrations. Despite all these positives, I loathed the story. I found this little old fairy tale at my Mom's house. The inscription which was hand written on the inside cover said, "Ila Carlisle, I am 14 1/2 and I have light brown hair and right now it is fixed like this and is pretty. I have blue eyes and ugly teeth and ugly smile. I am not so hot looking. I had a heavenly time at Marg's wedding." My Aunt Marg got married in August of 1936. I was intrigued about how this young girl felt about herself, and how I felt about myself as a young teenage girl. I I found this little old fairy tale at my Mom's house. The inscription which was hand written on the inside cover said, "Ila Carlisle, I am 14 1/2 and I have light brown hair and right now it is fixed like this and is pretty. I have blue eyes and ugly teeth and ugly smile. I am not so hot looking. I had a heavenly time at Marg's wedding." Dinah Maria Craik (born Dinah Maria Mulock, also often credited as Miss Mulock or Mrs. Craik) was an English novelist and poet. She was born at Stoke-on-Trent and brought up in Newcastle-under-Lyme, Staffordshire. After the death of her mother in 1845, Dinah Maria Mulock settled in London about 1846. She was determined to obtain a livelihood by her pen, and, beginning with fiction for children, adv Dinah Maria Craik (born Dinah Maria Mulock, also often credited as Miss Mulock or Mrs. Craik) was an English novelist and poet. She was born at Stoke-on-Trent and brought up in Newcastle-under-Lyme, Staffordshire. After the death of her mother in 1845, Dinah Maria Mulock settled in London about 1846. She was determined to obtain a livelihood by her pen, and, beginning with fiction for children, advanced steadily until placed in the front rank of the women novelists of her day. She is best known for the novel John Halifax, Gentleman (1856). She followed this with A Life for a Life (1859), which she considered to be the best of her novels, and several other works. She also published some poetry, narratives of tours in Ireland and Cornwall, and A Woman's Thoughts about Women (1858). She married George Lillie Craik a partner with Alexander Macmillan in the publishing house of Macmillan & Company, and nephew of George Lillie Craik, in 1864. They adopted a foundling baby girl, Dorothy, in 1869.